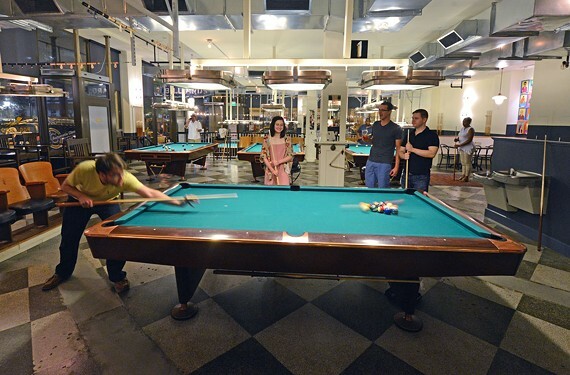 Socializing can take the form of friendly competition at Greenleaf’s Pool Room, which is attached to the Hotel John Marshall, at 100 N. Sixth at Franklin Street. A bar is generally a place where you go to have a drink, some conversation and perhaps a bite to eat. Hang with friends. Or maybe just stare mindlessly at a television and get lost in thought. Playing games, other than the occasional round of “Golden Tee” or “Big Buck Hunter,” typically hasn’t been high on the list of bar activities. But that’s been changing. Greenleaf’s Pool Room has connected with evening crowds who want to take a shot along with their shot. Don’t know your way around a billiard table? Free lessons are available for beginners, along with craft cocktails and well-made small plates to keep you going during a long night. But that’s not the only way to knock little balls around. Cha Cha’s Cantina has Water Pong Wednesdays. Or perhaps you want to play Skee-Ball while you sip? Try Baja Bean Co.
Trivia, darts, board games — even Dungeons & Dragons, are becoming staples at some bars and breweries. Demetrios Tsiptsis, co-owner of New York Deli in Carytown, started Game Night on Sundays, which he says has helped build a regular clientele on a typically slow night for bars. Embracing your inner nerdom is easy, with tables for Dungeons & Dragons, Love Letter, Story Cubes and whatever else you want to bring. Cards Against Humanity, which has served as an entertaining option at house parties, has become a force locally too. Social 52 on the Main Street strip has an especially popular such night on Tuesdays. Other popular game nights include Piko Trivia and Dare Night on Sundays at Sticky Rice, Monday nights at Garden Grove Brewing and Night Owl Trivia at Bellytimber Tavern on Tuesdays. And the list goes on.